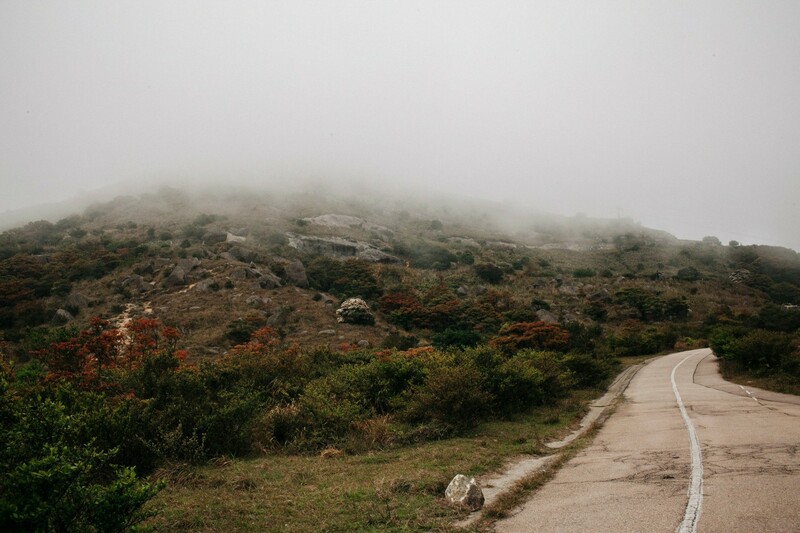 The frequent fog enshrouding Hong Kong’s highest peak is perhaps emblematic of the mountain’s past; the long-extinct volcano has indifferently carried military men, tea merchants, and hikers for centuries. 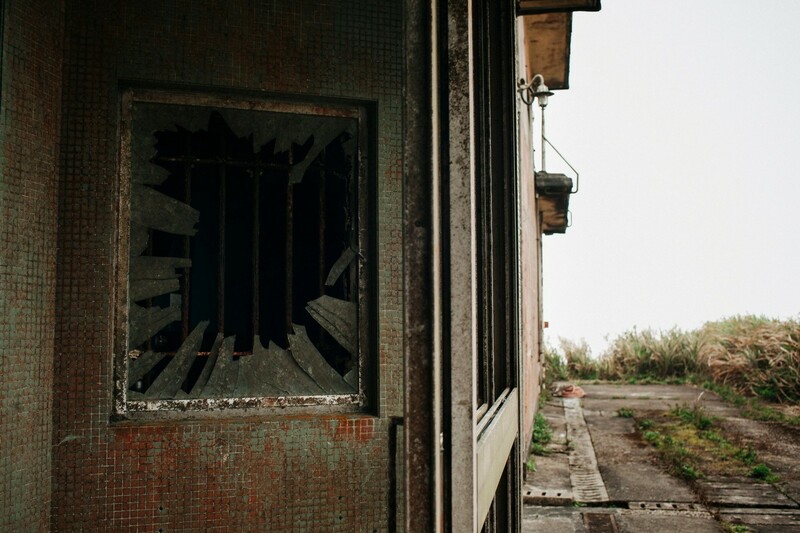 Routes crisscrossing Tai Mo Shan offer hints of its past in the thriving, wild camellia tea plants, the haunting abandoned British Military barracks, and the subtle marks of villages long gone. It is impossible to truly summit the 957-metre mountain, as it is topped by the gigantic orb-like structure of the Hong Kong Observatory’s largest weather radar. 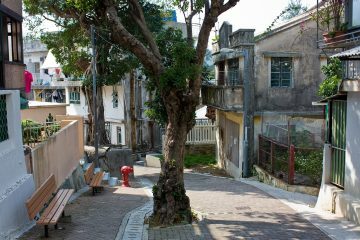 A near summit can be underwhelming if the mountain is climbed from the Tai Mo Shan Visitor Centre, which leads hikers to a mild, paved path winding up the southern slope. Approaching the mountain from the north however, is somewhat arduous and far more satisfying for those who prefer a difficult hike or a swim en route. 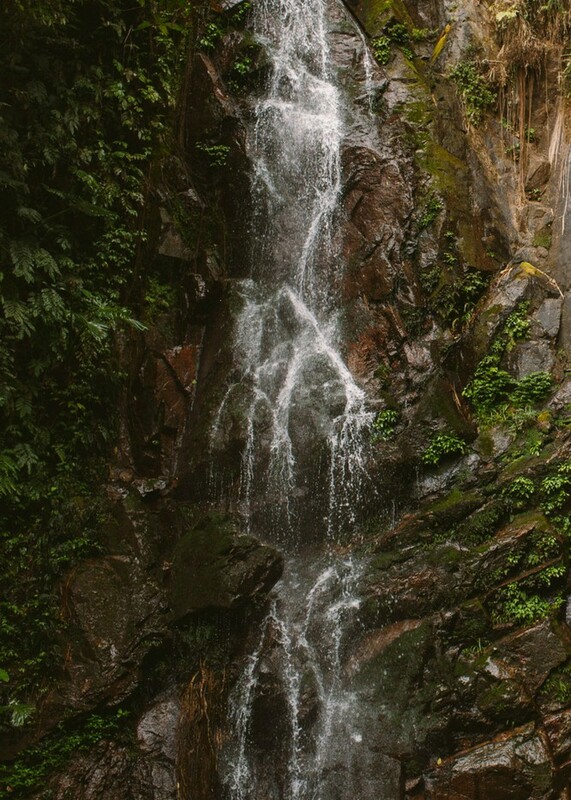 Starting from the north, in the village of Ng Tung Chai (ng4 tung4 zaai6 梧桐寨, “Parasol Tree Village”) will lead hikers past five waterfalls, one of which is the tallest in Hong Kong. It is imaginatively named Main Fall or Long Fall (or simply Ng Tung Chai Falls in Chinese – ng4 tung4 zaai6 buk6 bou3 梧桐寨瀑布). The footpath begins winding through the small village, dotted with banana and papaya trees and modest vegetable gardens. The falls and the streams, the rivers and the lives map the fairyland of phoenix trees. The fog girdles the green mountaintop, with ancient caves at the South Mountain enveloping a heavenly otherworld. The mystic couplet offers a short description of what is ahead. 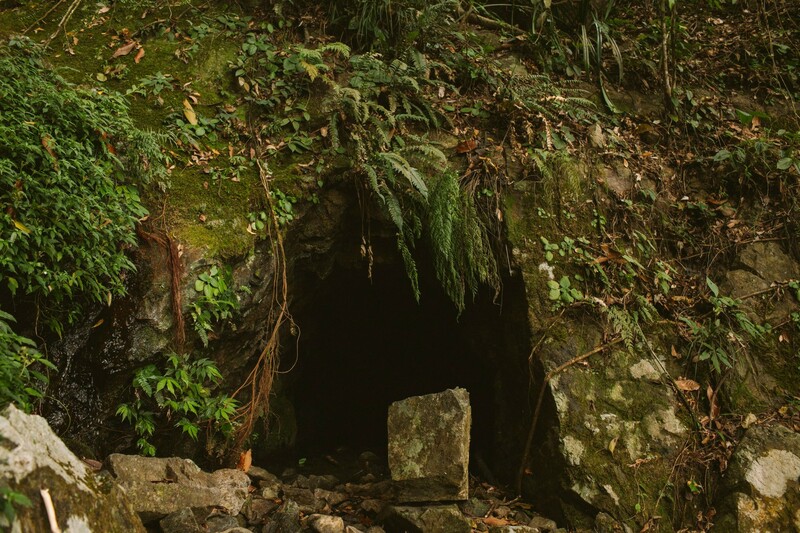 The trail intertwines with the stream, passing the falls and three ominous caves, which are in fact are not caves at all, but tunnels – remnants of Japanese occupation. 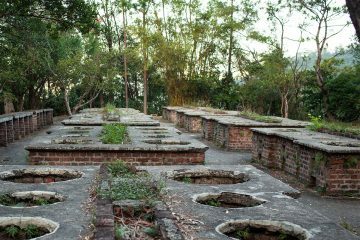 Past the third cave, the trail goes directly through the remains of a cement structure likely built by the Japanese military, though the others on the mountain have been destroyed. 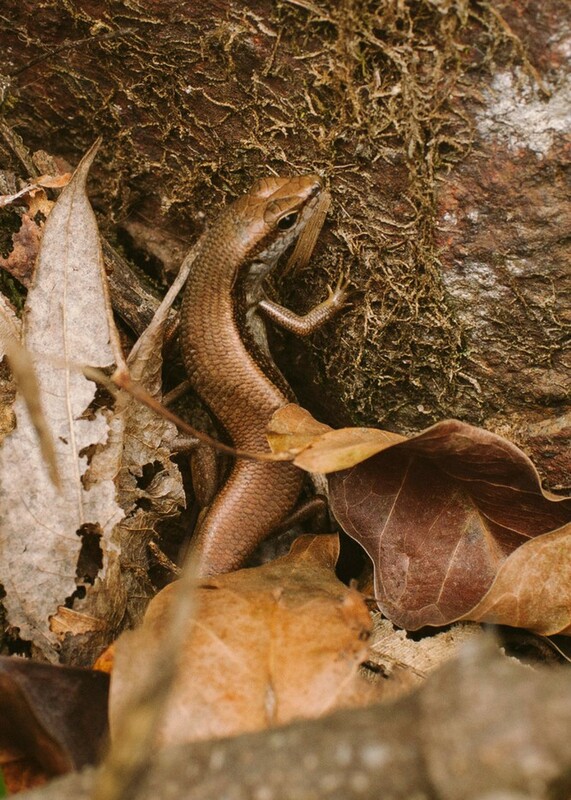 As banana groves and wild taro populated with salamanders give way to darkened thickets of bamboo, one cannot help but notice the diversity of ecosystems thriving on the wetter side of Tai Mo Shan. Canopy ferns and creeping vines thin out as the elevation increases, making room for grasses and narrowing the possibility of snake sightings. The Phoenix trees are perhaps a reference to the red tips that abound this time of year. 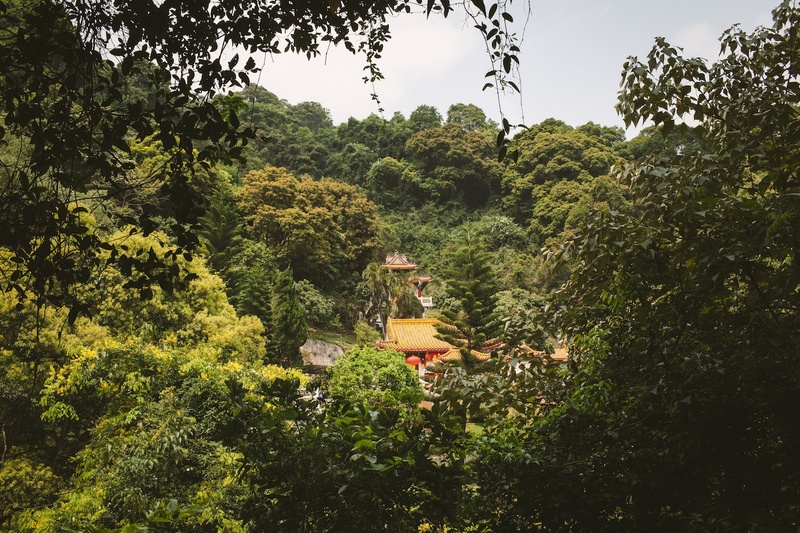 As the coldest part of Hong Kong, the hardwood trees on Tai Mo Shan sprout visible new growth rich in red hues that help young leaves withstand threats like residual cold, UV rays, and air pollution. 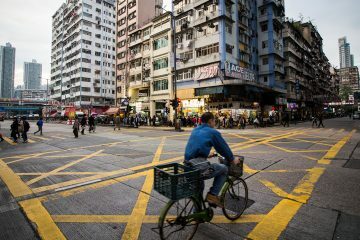 Along with the white and pink flowering camellia and the plentiful greens, the foliage is is as multicolored in late Winter and early Spring as Hong Kong can be. Above the tree line, a thick layer of fog envelops the mountain more often than not. On mistier days it looks as if there is nothing at all below the mountain, no megacity teeming with its own type of life. On the rare clear day however, the view is vast, including the Northern and Western New Territories, Hong Kong’s flat plain lands, and with luck, Shenzhen. Tai Mo Shan translates from Cantonese (daai6 mou6 saan1 大帽山) to both “Foggy Mountain” and “Big Hat Mountain,” the hat being the fog or clouds encircling the mountain. 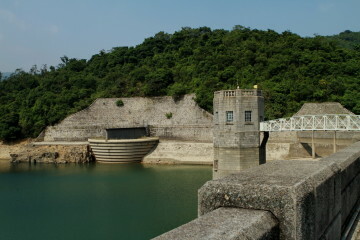 It receives 30 percent more rainfall than the rest of Hong Kong according to the Agriculture, Fisheries, and Conservation Department. Winter brings foggy uniformity whereas in Summer the mountain is often sunny with a cluster of cotton ball-like cumulus clouds surrounding the top. 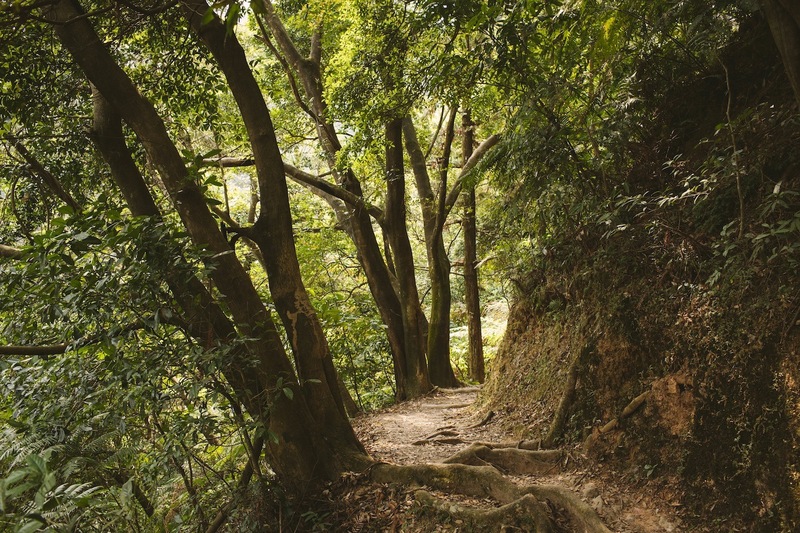 The climate is perfect for wild tea bushes, and green tea from Tai Mo Shan attracted some fame in the 17th century when a number of small plantations were built. 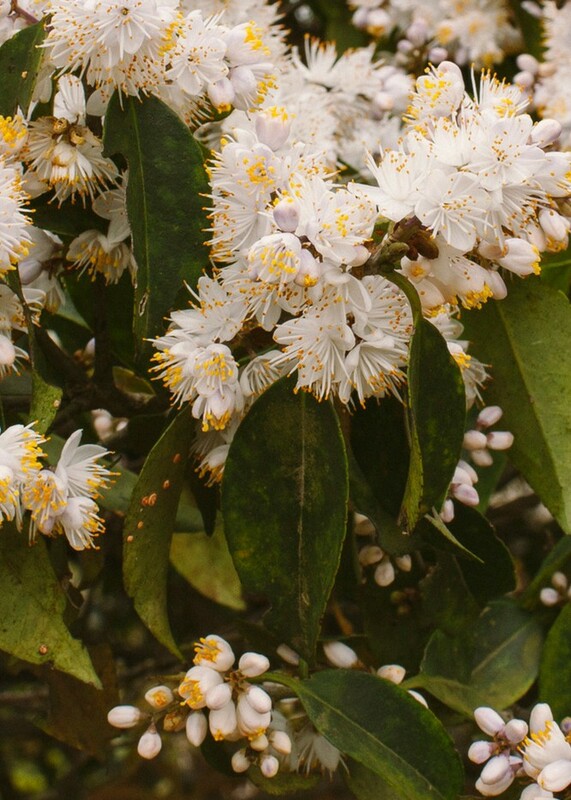 The plant, camellia granthamiana is thought to be the largest tea bush in the world. 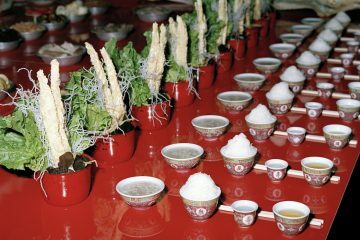 The famed green tea known was known as wun mo cha (wun6 mo1 caa4 換麼茶) meaning “mist tea” or “cloud tea.” Apparently people still pick the wild shoots from time to time in the spring. Another age-old attraction to the mountain is the frost that has led so-called “frost seekers” stranded on the mountain top. Last year the fire department received twenty calls one morning from groups stranded on the the mountain top, unable to walk upon, or let alone drive down, the ice-slicked road. 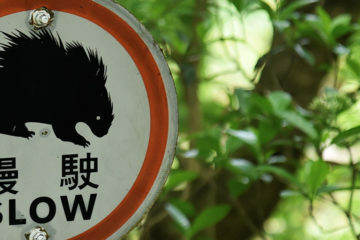 On most days of the year however, the descent is a simple walk down a paved road that has seen been used by the militaries of Britain, Japan and now China. 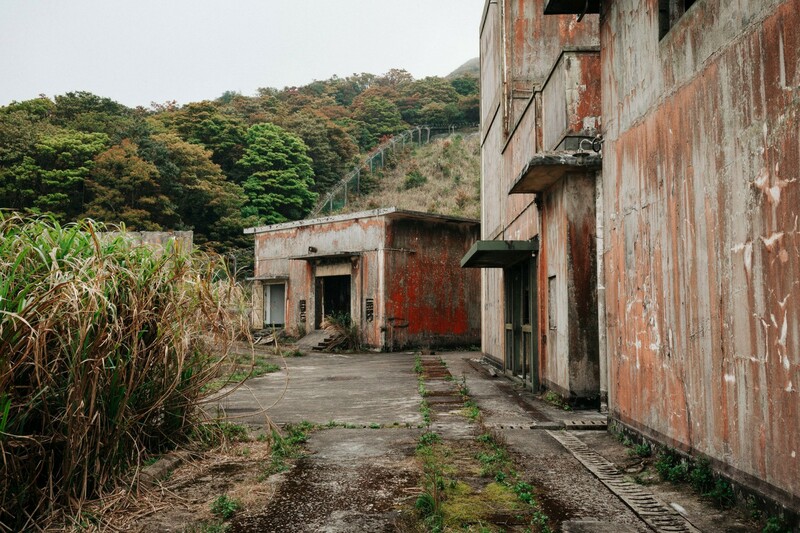 Alongside the observatory radar is a small complex of buildings and a basketball court where hikers have from time to time spotted military personnel from the outside the metal fence. The road down to Tai Mo Shan Country Park entrance is likely one of Hong Kong’s best cycling routes. The road is paved, semi-steep, winding, scenic, and best of all, nearly car free. Walking it pales in comparison to the visible thrill that cyclists experience here. 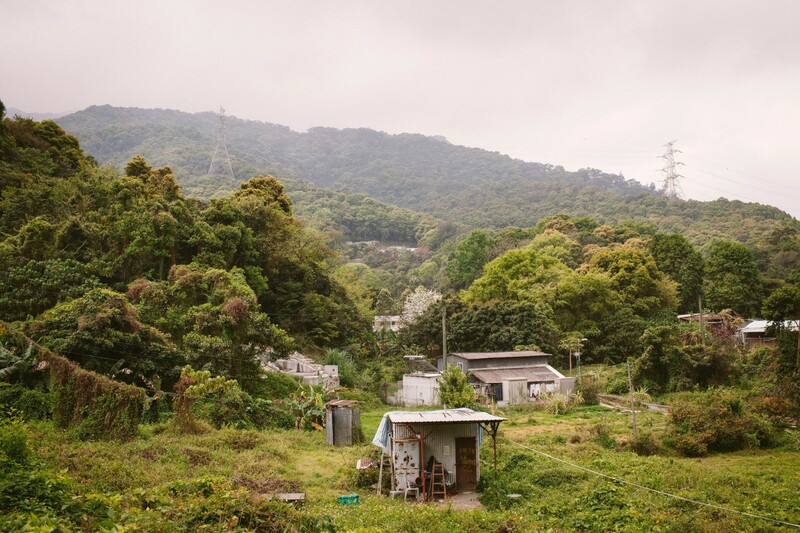 Near the bottom, out of the mountain’s misty spell, cows graze on park grass, families picnic, and day to day life returns gently before entering back into the concrete jungles of Kowloon and Hong Kong Island. Luckily, the relief of Tai Mo Shan; the sweet smell of camellia, the cool spray of the waterfalls, the groundedness of the welded crystal tuff that the mountain is made of, and the notion of being well above the city will be there waiting for the next walk amongst the clouds. MTR’s West Rail Line to Kam Sheung Road Station and take minibus 64K to Ng Tung Chai Tsuen. You can also take the East Rail Line to Tai Wo Station and then minibus 25K Lam Tsuen to Chai Kek. If you go by taxi, alight at Ng Tung Chai village on the main road by the minibus stops. 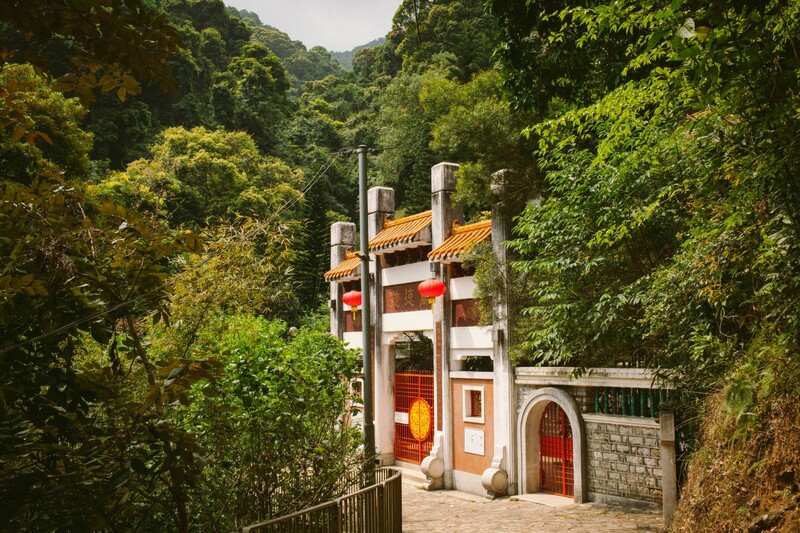 Walk along the roadside footpath through the small village of Ng Tung Chai to the Ng Tung Chai Waterfall Path then follow signs for Tai Mo Shan via Ng Tung Chai Waterfalls. Mobile phone service on the mountain is spotty at times, but Google Maps works throughout the hike. Bring at least one litre of water per person – and a bathing suit! Originally from the pinpoint town of Hana, Hawaii, Viola has freelanced for a mix of publications, photographing the island life for the Maui News and city life for Yes! Magazine in Seattle. Viola has a passion for photographing intimate pieces on people, places, their culture and their stories. The intricacies of form, light, shadow, and expression inspire Viola to capture the raw imperfect beauty this world is made of. 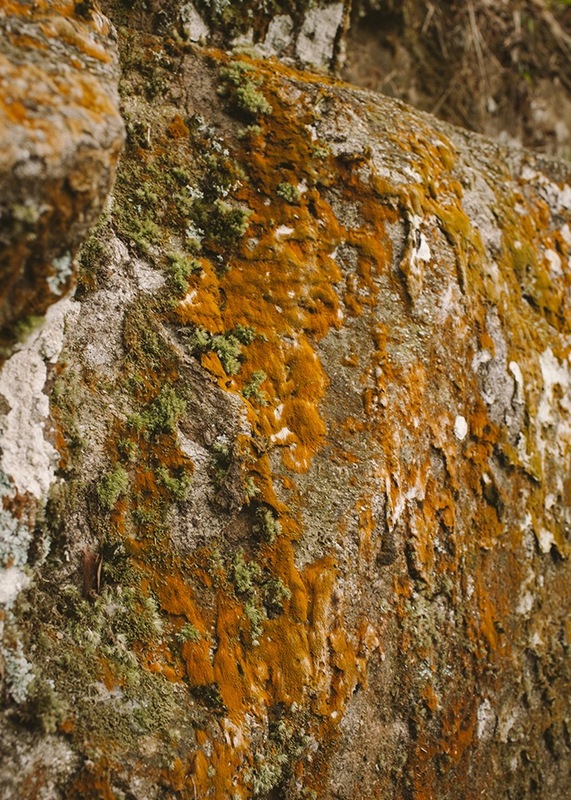 Alongside photography, she loves fruit, urban exploration, hiking, yoga and being in the ocean. Wild tea plants, peculiar weather, a massive waterfall and a historic military presence await visits to Tai Mo Shan.